The A14 remains closed in both directions this afternoon as fire crews struggle to extinguish a lorry fire. The lorry was carrying boxes of clothing and specialist equipment from Suffolk Fire and Rescue has been brought in to help tackle the blaze. A Highways England spokesman said: "The load is proving difficult to extinguish. Both carriageways remain closed to enable fire crews access to the scene. Trapped traffic continues to be released from within the closure, however this is unfortunately a slow process." "If you're caught within the closure of the eastbound carriageway, then Police are working to release you via a contra-flow system. If you're caught within the closure on the westbound carriageway, then our Traffic Officers are turning you via the rear of the queue." The A14 remains closed in both directions between J31 for Godmanchester and J24 for Girton. The M11 is also closed northbound at J13. 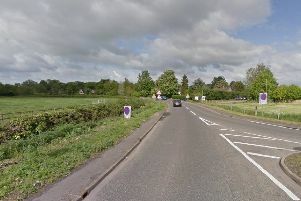 The closure is having a knock-on result on the A428 and A1198 in the Papworth and Cambourne area as a result.